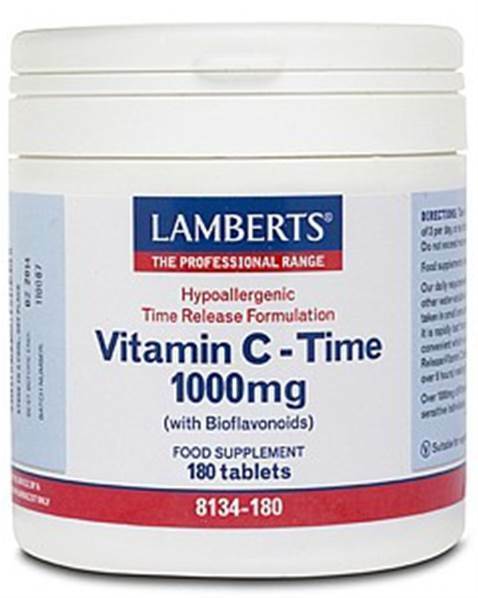 Vitamin C health supplement with Bioflavonoids and Rose Hips are specially formulated to release the vitamin C over 6-8 hours so that absorption absorption occurs gradually to create a more stable level of vitamin C for a longer period. 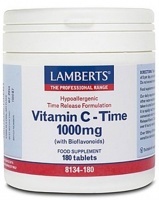 Lamberts® Time Release Vitamin C 1000mg tablets also contain a relevant level of bioflavonoids because they are known to aid vitamin C absorption. Bioflavonoids have also been demonstrated to have specific effects including a strengthening effect on the capillaries. Hydroxypropyl Methylcellulose, DiCalcium Phosphate, Anti-caking Agents (Silicon Dioxide & Magnesium Stearate), Microcrystalline Cellulose, Stearic Acid, Tablet Coating (Hydroxypropyl Methylcellulose, Glycerin).